We are referred to as a reliable manufacturer, exporter and supplier of Diamond Core Drill (Z1Z-TK06-80) from Yongkang, China. Suitable for drilling material such as reinforced concrete, brick and other construction material, these Diamond Core Drills are used for core drilling in walls, floors, roofs and road surfaces. 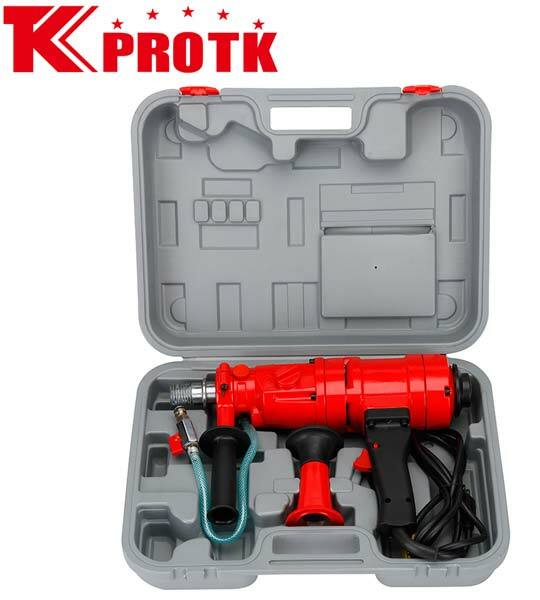 We offer this Diamond Core Drill with safety clutch and Electric Leakage Protection. The Drill comes with a three-gear rotary speed, which is helpful for drilling different size holes. This Core Drill comprises of an adaptable water spigot for wet drilling and an optional stand. This Core Drill requires an input power of 1500W. Top gear(3450r/min) is for smaller drill bits 0.5"-1.5"
Bottom gear(950r/min) is for larger drill bits 2.5"-4"
Available for dry bit drilling. Can be used with stand.